After years of denial, why is Lance Armstrong admitting he used PEDs now? Of all the questions Lance Armstrong needs to answer about his use of performance-enhancing drugs and subsequent years of denial, explaining why he’s decided to come clean now might be the most revealing. 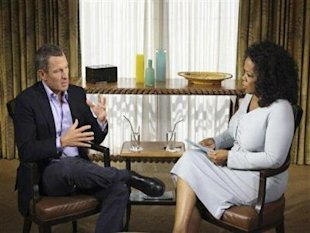 According to Oprah Winfrey, who conducted the yet-to-be-broadcast interview with Armstrong on Monday, the disgraced former Tour de France champion didn’t provide a clear answer into that psyche. That’s because there is no easy answer. Armstrong made millions of dollars on a fairy tale that turned out to be a ruse, and cleaning up that mess isn’t as simple as just saying, “Sorry, I cheated.” There’s litigation involved, financial repercussions to face and, in his case, a foundation that’s much bigger than him to consider. He no longer can face perjury charges. In 2005, Armstrong testified under oath that he never used performance-enhancing drugs. The statute of limitations on that testimony ran out after seven years, meaning Armstrong cannot be tried for perjury. He’s trying to repair his legacy. In the wake of the 1,000-page U.S. Anti-Doping Agency report that outlines in great detail his use of PEDs, Armstrong’s continued denials only further tarnish his life and legacy. In short, he’s lost this battle, and Armstrong doesn’t take to losing easily. Admitting guilt now is a way for him to take control of his future and, potentially, allow him to win in the end, maybe as the “hero” who cleans up cycling. Oprah Winfrey called her interview with Lance Armstrong “He’s been very good at figuring out ways forward, to game a situation and work it, and figure out ways to turn a bad situation into a better situation,” explained Dan Coyle, a journalist who’s followed Armstrong’s career intently. Along with Armstrong’s former teammate Tyler Hamilton, Coyle co-authored The Secret Race, a spy-like novel that provides a window into the rampant doping system employed by the United States Postal Service team during the Tour de France. He wants to compete again. The U.S. Anti-Doping Agency has banned Armstrong from competing for life. There is speculation that Armstrong, still with the desire to compete in triathlons, is hoping to have the ban lifted if he cooperates with USADA. This seems an unlikely reason to admit guilt now, as the ban, if lifted, would stand for another eight years, when Armstrong would be 50. His lawyers say it’s OK. Armstrong received millions in bonus money from his team for his seven Tour de France victories, and millions more from sponsors who used his unbelievable story to sell their products. However, there were reportedly stipulations attached to those bonuses and contracts, stipulations that were contingent upon Armstrong being clean. SCA Promotions, the company that paid Armstrong $7.5 million in bonus money in 2006 as part of a legal settlement and $12 million total, has indicated that it may seek reimbursement for some or all of that money. When Armstrong showed up for the interview with Oprah, his lawyers came in tow. Though they weren’t in the room during the interview, according to Winfrey, Armstrong had surely been briefed on what any admission of guilt will mean for him financially. He’s truly remorseful. Whatever you think of Armstrong, there is no denying his Livestrong Foundation has, is and will continue to benefit cancer patients and survivors around the world. By coming clean, Armstrong can possibly remove a black cloud that’s impeding the foundation’s work. On a more personal level, Armstrong napalmed a good number of friends and associates who dared to speak the truth about his use of PEDs. He sued them, called them liars and even resorted to intimidation. Maybe now he’s seen the light and wants to make amends. One Response to After years of denial, why is Lance Armstrong admitting he used PEDs now? Your right on Don !! I hope kids lean from this ! !